It's March! (even though Blogger says it's still yesterday). And I am leaving for Australia on the 27th! So much to do. So much to think about in the wee small wakeful hours of the night....I will make a daily log of the Things Done and the Things To Do, and if anyone spots a serious omission, feel free to tell me; just make sure you do this in enough time for me to sort it! Things Done: ticket, visa, insurance, house and pet carers organised, iPod loaded, passport expiry date checked (ages ago). Things To Do: everything else. What I'm packing is simple compared to what I'm leaving - just thinking about how much pet food has to be bought and stored is daunting. And those 2 stones are not really going to get lost in 27 days, I suspect. And Kevin? Perhaps being in denial about Kevin is the best position to take - just for now. There is more to my life than cat-obsessing, you know. The gales have resumed, and make dog-walking a serious hazard. She hates the wind, and gets very silly and skittish, runs out in the road, importunes strangers to take her home with them, and eventually tries to slope off home without my noticing. Not that I can blame her, as I get very silly and skittish too (not really; I just hate windy weather with a passion), so we had a domesticated morning indoors. I have made cakes today, including some experimental bun things involving lemon and walnuts (more leftover pecans than walnut) which proved to be rather nice despite some serious deviation from the recipe, which was actually for a tealoaf. 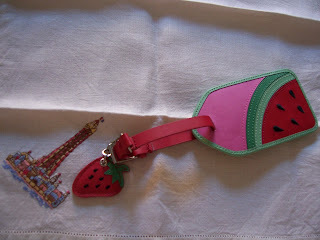 I am going to give one to Lesley, who leaves for Hong Kong tomorrow, to wish her a safe journey. Lesley, you may post your verdict if you want to, but I know you are like my young Official Tasters, and are never truly professional and critical. Which is a relief to me, really. Now that I come to think of them, where are those Tasters? I haven't seen them for ages. First sign of Springlike weather and they'll be out again, whooping and shrieking in the street, playing hugely imaginative games and scattering crumbs and sweets, which is what has turned my once-sober little dog into a shameless guttersnipe, scavenging for what the children and local students leave in their wake. Anything too large for her small mouth and 8 teeth gets smuggled into the house and hidden, regardless of its toxicity and threat to life; I have found stale half-cupcakes, rock-like crusts of toast, worryingly aged spare ribs and fossilised chicken thigh bones tucked into corners or under her bedding. Thankfully, she seems to have stopped burying illicit items in the cat litter tray....I will spare you the details, but oh, believe me, you can't be too particular (or fancy yourself as having a nice house) when you live with small determined animals! Much better today. Thank you for asking. He resumed his usual place in the Gang of Three which advances menacingly on me at 5 o'clock each day to let me know that it's Dinnertime. He ate some of his own food, heavily laced with tuna, then pushed Harry off his dish to polish that off too. Only tiny quantities, but at least he's eating. 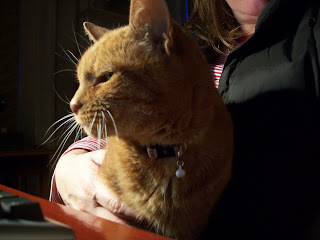 This is him now, sitting on my knee as I write. A peaceful night, sleeping soundly, tucked up with me; some purring, which made me realise he hasn't been purring recently. The magic wand of antibiotics? And then a quiet day, not looking exactly better, but clearly not distressed or restless like yesterday. He has had a change of heart about his expensive special food - now it's black poison that cannot possibly be eaten by any self-respecting cat......though now that a bit of tuna has been mixed in with it, maybe a mouthful or two......? Ooh, and is that raw chicken? The internet yields a wide range of conflicting expert opinions on diets for cats with kidney failure, with many condemning the very same diet that I have been persuaded to buy for Kevin. It is so confusing and downright alarming that I will follow the ones that say I can feed him certain foods along with the special diet rather than risk him losing even more weight. As Kevin is almost eighteen-and-a-half, I am not hoping for miracles, but need to be sure that I have tried all that can be done for him, which includes waiting for all the tests to be completed before making any decisions or writing him off as a hopeless case. Meantime, I shall feed him little bits of stuff that he likes, encourage him to drink water, and watch him carefully (for carefully, read broodingly and obsessively). 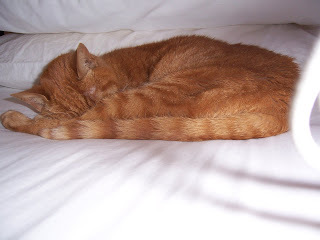 He is the last of the Magnificent Seven, and when he goes, that will be the end of an era that began in 1977 when I moved here with two cats and began collecting waifs and strays. Anyway, enough cat talk. I am worn out with the strain of it all. But James won Masterchef, and all's right with the world. It was a gripping series, but one which made me realise that I really can't cook very well or adventurously at all. Thank goodness I make decent cheese scones for my friends and know how to open cans of tuna for my ancient moggies; that will have to suffice as culinary self-worth for now. The vet rang to say that the blood tests were finished and that one of the hideous possibilities has been ruled out. That leaves a bladder infection and kidney failure to deal with. Kevin is full of antibiotics, kidney medication and very expensive special diet food, and is recovering from his ordeal in the way he prefers. If you look closely enough, you might see him breathing deeply. This dear old chap is very poorly indeed. 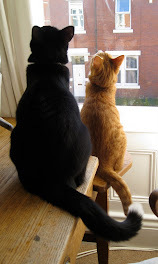 We spent a dreadful hour together at the vets today, trying to make sense of a complicated array of serious problems. Tests have been undertaken, some results still awaited, but good news is unlikely. I noted that Kevin had enough of his old spirit to swear and spit at the vet in the time-honoured way, and to leave her and me liberally covered in ginger hair. News to follow as I get it. I didn't just ignore those fallen roof tiles, slatternly though I am. I went out into the road and gazed pessimistically at my roof. They didn't appear to have fallen down from there (though there's still time). Given the force of today's gales, those tiles may well have come from Stornoway, where the weather makes ours look positively Mediterranean. But this was how the weatherman described the gales now lashing us - 67 mph in Newcastle! Wheelie bins are practising their jump jet take-off technique, and small children are being sewn into their pushchairs. I have been into town on foot, leaning well forward, Marcel Marceau mime-style, with my coat billowing like the parachutes that bring the Space Shuttle to a halt. Very nerve-wracking; I seem to recall some research that found windy weather was detrimental to human mental health, and I could believe it. Grown men were cowering in doorways, sobbing and pleading for it to stop. But I arrived determined to accomplish some purposeful shopping, and immediately came across a newly-opened optician's, all shiny and beckoning, so, on impulse, I got my eyes tested (for free!) for the first time in years. This took a long time, and was extremely thorough. A strange experience, though. Optometrists are like dentists, in that they see you in a most unflattering way, i.e. with your mouth unnaturally wide open or with one of those bizarre devices on your nose like the ones that Johnny Depp wore in Sleepy Hollow. And they have to get up closer than you would want a stranger, or even most of your nearest and dearest, to do, and shine lights in your eyes. At least I could answer questions today without my mouth being full of cotton wool and gurgling spit-sucking tubes. Weakened by the shiny-shiny technology and the sheer charm of the pleasant young optometrist, I yielded to the dazzling array of designer specs, and chose a pair a zillion times more expensive than I intended. Shopping, purposeful or otherwise, deteriorated rapidly after that. I bought some audio books for the plane journey, a new washbag that would not bring shame to the family name, and browsed the luggage displays, horrifying myself with the prices of small suitcases that would only be thrown, dropped, trashed, filthied in transit, and probably end up misdirected to the far East. Then I got the bus home, watching pedestrians flailing helplessly in the wind and clutching lamp posts, and, crunching over fallen roof tiles, I shut my front door with a sigh of relief. And then I caught up with those leftover hot cross buns. Well, carbohydrates are calming, after all. 7. Research cameras online. Find that shaky hands are a common problem - yay! not just you! Today's plan was to get up early(ish) and go into town. I had birthday presents to buy, book tokens to spend, and maybe I could start my shopping for Australia. There's no way I could risk Customs with that ancient washbag! But it just didn't come together. I got up feeling weak and feeble, found that nothing wearable was ironed, there was nothing nice for breakfast, and the idea of traipsing round the shops, even limiting myself to John Lewis, began to feel as appealing as hang gliding solo off Macchu Picchu. Just the sort of day where everything you touch in John Lewis gives you a nasty little shock of static electricity, and the trauma makes you forget everything you went in for. So I went to Sainsbury's instead, unimaginative but necessary, and stocked up on nice fruit and yoghurt, as well as a pack of hot cross buns, enticed into the latter by Posy. I think that I'm having a delayed mope because the Lovely Son has gone back to London. The dog does her moping at the window as we set off for the station, and is back to her chipper little self by the time I return alone, but it takes me a little longer. 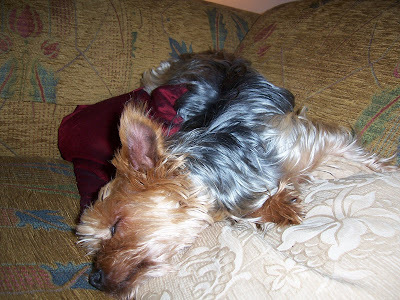 Two hot cross buns and a cup of tea have helped, though chipper isn't how I'd describe my view of the world today. Best stay home, I think, rather than risk buying books on Empty Nest Syndrome or hideous holiday footwear that looks like recycled tyres. Maybe I should do my nails and practise those chin exercises. I was reading Obachan (see list on right) and was tickled to see her Spam Fried Rice dish. As there was a photograph of it, I knew it wasn't a joke. Clearly I have missed out on a whole branch of culinary sophistication. On impulse, I Googled Spam recipes, and found that there are many many of them out there. Some are weird and wonderful, some are just vile, but the sheer volume of them is what is so astonishing. Go on, dare you. Make a Spam dish today! And send me a photograph of it. I have had two presents in 24 hours. Barbara thought I should have something on my suitcase that would make it stand out on the airport carousel, so she gave me this very eye-catching luggage tag. I think it should do the trick all right. And Charlotte's grandma Carol gave me this little tray cloth. It has a hand-embroidered tower that has set me wondering. It looks like Blackpool Tower to me, and has blue waves in front of it, but careful scrutiny reveals a decidedly French tricolor on the top. A seaside Eiffel Tower? Any other ideas? All I need now for my big trip is a hat, preferably one that reads "Embrassez-moi rapide". I thought I should remind us all that the pond, though weedy, was actually quite pretty and full of life last summer. Hopefully the recent radical cleanse performed by Sandra-with-bucket should help it to regain its odour-free charm and entice little frogs. 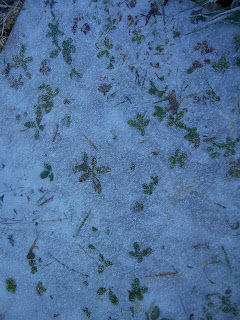 Yes, I know there are nettles; we call them our wildlife project. Failure to warm up + digging heavy soil + shifting timber offcuts = sore back. My own fault. 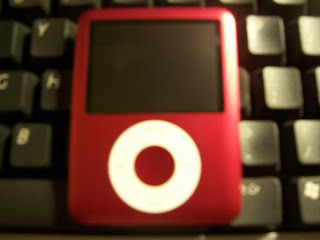 I am overwhelmed with self-pity, and not even a shiny new raspberry-red iPod Nano helps. 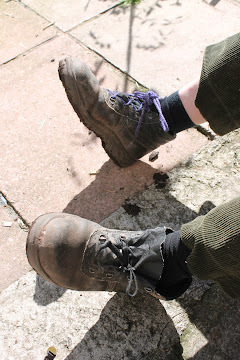 Do you have to be fit to work on an allotment or does an allotment make you fit? Today, I would say the former. I ache in many places. Today the Lovely Son fixed the shed, and set to with wood and screws, creating a new compost bin of gargantuan proportions to replace the rickety old one. I took the opportunity of emptying the current compost heap, sorting the new material, ie still-recognisable kitchen waste (so many teabags!!) from the rich dark crumbly "black gold" that the sainted Monty enthuses about. Then flushed with pride, I wheelbarrowed the black gold to other places in dire need of a bit of organic oomph. I hadn't realised until today that the old wheelbarrow, rescued from a skip, has an inflatable tyre, currently in need of a bit of an inflate. Another item to continually forget to bring from home: tinsnips, garlic, peanuts, dibber, bicycle pump....Oh, and someone has stolen our good spade, and the shears. Curse them. I also tried to construct the new rose arch, the old one having eventually yielded to corrosion and gales. The replacement cost £4.99, about £1 more than its predecessor, so we don't expect much from it. Opening the box was my first mistake. No glasses (again), tiny instructions, 5000 pieces of metal, with bolts, and I could feel my enthusiasm draining away. I rang Sandra, who is handy with such things, and sweet-talked her into coming down to do it for me, and could she bring some matches too? Yes, she said, obligingly, not knowing what was in store. She looked at the many pieces of metal and all the bolts, and I could see that her heart sank too. Silently, we put all the bits back in the box and promised ourselves that we would do it another time soon. Preferably by encouraging Dave to do it for us. 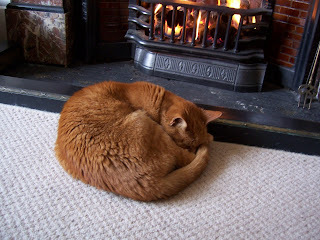 But we had a little fire, and yesterday's evil rose prunings went into it, just to make sure. Within moments we smelled well-kippered; people talk fancifully about the evocative scent of woodsmoke, but it isn't thrilling when it permeates your clothes and newly-washed hair and makes you cough like your grandad. While we were in malodorous mode, I shovelled manure, and Sandra bravely emptied the stinky pond. And how worthwhile that was! for at the bottom, deep in black mud, sat a little frog - yes, alive - proving that optimistic Angus was right. We filled the pond up again with fresh water, hoping that the shock of icy barrel water wouldn't put the little creature off from telling its mates that there was now a delightful and salubrious breeding pond in place of the Mordor-Class-A cesspit we had neglected so irresponsibly during the autumn leaf-fall. After a bit of general light duties, including leaning on shovels and sucking our teeth in a contemplative manner, Sandra and I went home, leaving the LS to finish his tasks but promising to have his lunch ready for him. The dog was too quick for me, and tracked mud all over the sitting room; the revenge of the second bath in a week might be in order now. Today, the Lovely Son and I spent some time on the allotment. The water butts were solidly iced over, but the sun was warm, and there was birdsong all around us, interspersed by teenagers whooping and roaring through the park nearby. It remains a mystery to me how adolescents who can only grunt at home become astonishingly loud when out with their friends. There was a lot to do. We had undertaken a reccie yesterday, to plan our assault on rampant Nature, but made the mistake of walking down the hill, still frost-whitened, instead of taking the path through the trees. The LS, carrying timber for fence repairs, was the first to fall over - twice - slipping theatrically, and landing in such a way as to cover a large portion of himself in cold mud. In his good coat too. I was punished for laughing by falling over seconds later, with the same result. Strangely, no one cried, swore, or tried to blame someone else, but there was cruel laughter from workmen in the houses at the top of the hill. We crept home half an hour later looking like rejects from some bizarre and hugely misguided mother-and-child rugby trials, hoping not to meet anyone, but no such luck: Lesley and Sandra spotted us and were hugely entertained. You know who your mates are when you're up to your eyes in muck. 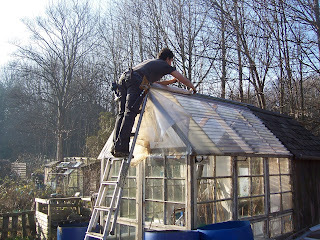 Today the LS repaired the ramshackle collection of old window frames and brittle sheets of recycled perspex we laughingly call the greenhouse, and I pruned and sheared round the stinky pond and the dense Weed Collection which we once thought might be a herbaceous border. I got hopelessly entangled in the killer thorns of whippy out of control roses, and had to be rescued. In spite of creating huge piles of debris, I don't seem to have made any difference at all to the overall chaos and disorder. Thankfully the ground remained frozen, so digging wasn't possible. 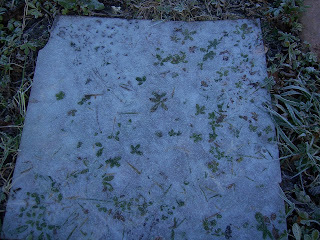 I took photos of Roger's pond, and of a sheet of perspex he had left lying on the ground, which had frozen over very prettily; I shall post this next. His plot is criss-crossed with fox pawprints again. I stuffed some clumps of cat hair, lovingly combed from Harry over the past few months, into gaps in the fence. This might seem to you to be a gross idea, and I do keep the bag of hair out of sight now, after visitors have expressed horror (Charlotte-the-Fashion-Student paled and almost swooned away, when I told her I was saving it up for her to knit with). The birds whisk this luxury tabby cashmere away in no time for their nest-building; I love the idea of baby birds nestled in soft fluffy cat hair, and somehow it seems a small act of reparation for the many birds my cats have despatched in the past. Harry is obliging enough to produce enough hair each Spring to stuff mattresses for the fledgling population of the North-East, and as he has never managed to catch a bird in his portly well-fed life, it is almost pure altruism, wouldn't you say? Kevin has never hunted either, and has less fur to comb out in a good cause, but for a ginger sissy-cat, he can dart quite convincing looks of pure malice at birds on the roof, and that seems to suit him well enough. People have told me that this blog is just like talking to me. How very alarming! It suggests that although I have a very small, narrow, uneventful existence, I still manage to produce a fair amount of drivel from it, both verbally and in writing. This got me thinking: what was my life and conversation like before retirement? Was drivel-production my default position even then? Probably. So, a serious topic, as a change from trivia. I am sometimes asked if I miss work. It's strange that after 40-odd years of going to work, I should miss so very very little of it now that I've stopped. This has made me think about how meaningful it really was or wasn't, and what I got out of it that I couldn't get now. I shall have to think about that some more....if and when I choose/dare/can be bothered. There's a painful contrast between those early hopeful days at the start of a career, compared with how drained and exhausted I ended up. 'Running to stand still' was a phrase that often came to mind at the time. Now I feel relieved of a massive burden. Nowadays, there's no running, and I feel quite busy enough. Just managing my house, albeit in the most haphazard (ie slatternly) way imaginable, monitoring fat Harry's weight, and remembering no more than 2 social appointments in a week - and that's a busy week! - seem like more than enough to be doing these days, and a state of calm, happiness even, has just crept in when I wasn't really looking. Do I miss work? Certainly not. But I do miss some people, colleagues who sat with me and became friends; Sue, who zoomed everywhere, ate at speed (and always included beetroot, no matter what the canteen choice was that day), could leave chocolate lying untouched on her desk for weeks, and who had a rich and foul vocabulary when crossed. And Karen, who moved at glacial speed, typed with her mouth open, and was always good to share cake with. Both deeply opinionated and not shy about stating their views. Forcibly. We had serious debates, lively disagreements and drivel-filled chats, and kept each other sane. They made me laugh a great deal, and were good to share the obsession or rant of the day with. I miss them both immensely, and am glad that we stay in touch. But I'm very glad I can do that from the sanctuary of home in my new small, uneventful and calm life. She said I stink. No I don't. I smell nice. Doggy nice. Open the door so I can dry myself on the furniture! Now I stink. Tea tree dog shampoo - pah! Yesterday Sandra and I went out for a walk - well, she needs to escape sometimes from the 4 enormous chaps in her family - and found ourselves close to the allotment, so we went in, on a sort of unannounced inspection. Somehow it didn't look as bleak and neglected as last time we looked. Maybe it was all the burgeoning green, the tight little buds everywhere, the fact that the shed has remained dry despite half its tin roof having blown off. The burgeoning green will include a terrifying amount of pernicious weeds, of course, but so far it all looks hopeful and encouraging. Last year I wasn't fit to do very much on the allotment, but this year will be different! So, somewhat inspired and ashamed at the same time, and despite not having gardening clothes on (well, Sandra didn't; you can't tell with me), we got the wheelbarrows and trundled off to the heap of manure (thank you, anonymous stable donor!) outside the gate, and barrowed 6 loads along to our plot. It's a start. Another 600 barrows would just about do it. It didn't smell overpowering, and we managed to stay quite clean too. Then I poked gingerly at the pond with a stick for a bit, and found it densely packed with rotting leaves, and most unlikely to attract frogs this Spring. It stank most vilely, like the worst blocked drain. Even Angus, who maintains that frogs will breed in a puddle, might lose his optimism in the stench of our little pond, once our pride and joy. Big job to do next week in our Spring Offensive! ...the Battle of Frogspawn Ridge....Sandra has bought strong long rubber gloves, but I think she may need a gas mask too. The dog got a Valentine card in today's post. A day late, but still, a Valentine card. I didn't. Maybe my technique is all wrong. Maybe I should sit very very close to people and breathe horribly on them, make googly soppy eyes at them, and convey a very clear message that they, and only they, are the one I truly love. and how it might look, if you manage to stay out of the Burns Unit. Bedtime last night was not cosy. I had just settled down to sleep when Kevin got up and gave his best impression of that scene in The Exorcist - you know the one - full, loud, dramatic projectile vomiting. Thankfully not on my bed, and his head did not turn full circle. Then he wandered off downstairs, yowling in a self-pitying way, and as I cleaned up, tried to convince me that as he was now a very empty little cat, maybe he should have an early breakfast? Cruelly, I ignored him. I know he wasn't ill, because, like other cats I have known and loved, I believe he can throw up recreationally, and has done so for all of his 18 years. The degree of drama that accompanies it is his speciality. Back to bed. I was still barely asleep when someone rang me at 1.05 a.m. from a mobile phone. I vaulted out of bed, on full alert, cats startled (dog indifferent, of course - nothing short of being poked with a stick and having her basket deliberately tipped over would get her out of bed in the middle of the night). In my fuddled brain, calls at such an hour certainly mean a catastrophe of Biblical proportions, but the phone only rang once. Once was enough. 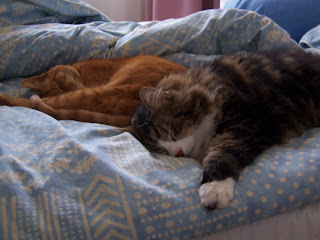 An hour later, I was still awake; believe me, the radio is dismal at that time of night, and with both cats trying to persuade me that it really could be their breakfast time, sleep was not going to come easily. 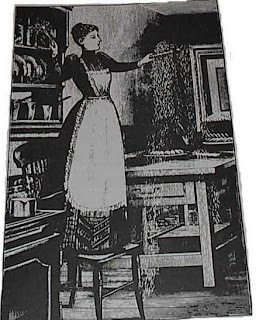 I did fancy trying my hand at sugar spinning, despite the risk of third-degree burns, but what do you do with it once you've produced it, if you don't have some wonderful creation to adorn and a table full of impressed dinner guests ready to swoon with delight? 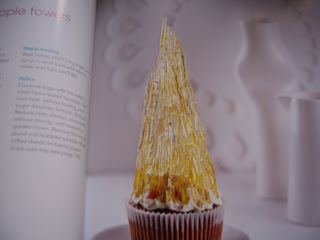 For those of you who aren't familiar with spun sugar, I shall post some pictures. I have never tried it, so I still have hope, so far unsullied by experience. This blurry little cupcake picture is to wish all of you a Happy Valentine's Day, especially those people who didn't get a card at all. The dog sends all her true loves amongst you a little wet lick. 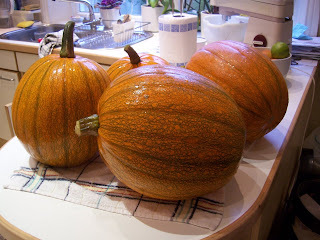 We did manage to grow some things last year. ...and a good laugh too. I have just been to see Sweeney Todd, and enjoyed every second of it, from the first moment to the last. This surprised me, as I don't like musicals (or Tim Burton films) as a rule. I'll spare you any cringe-worthy amateur film critic spiel, but anyone who knows how wimpy I am in films, how often I have to look away, or if watching at home, have to pop out to put the kettle on during a nerve-wracking scene, will marvel at my ability to watch without flinching as throats were cut and bodies disposed of in the most gruesome manner. Go and see it, do, and then we can have an animated discussion or even a lively fight about it. This morning, Sandra and I went to a new garden centre in preparation for the allotment season which will be upon us in no time, and we found garlic for Spring planting. 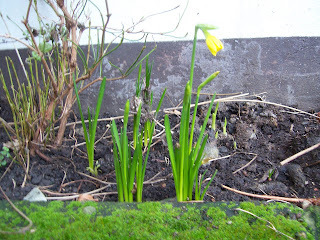 This has comforted me a lot, as I missed (ie forgot) planting my garlic on the shortest day, unlike the admirable Barbara, who gardens seriously, and Roger, who gardens artistically (witness frog pond with beach and solar-powered aerator) and have been creeping about in shame ever since, anticipating a garlic-free year with embarrassing admissions as the allotmenteers compare results in August. I met an ex-work colleague last year who expressed amazement and even pity when I admitted to a poor tomato yield (well, about 8 tomatoes, really); she said she had been struggling to harvest all of hers and had needed all 3 greenhouses to grow them all. I withered in the force of her confidence and noted her authentically filthy nails. Gardening is not always good for one's self-worth, you know. Sandra spent hours gazing at and comparing seed packets for both beetroot and carrots; these are her particular favourites. I know never to cross Sandra, as she has demonstrated her extraordinary inability to forgive a slight; she can still talk bitterly about last year's disappearing carrot seedlings and the holes in the beetroot. She doesn't care about my grief when all the lettuce bolts at once or the dwarf beans collapse and die, but speak lightly at your own peril of her vegetable tragedies. The Lovely Son is coming home on Monday, to help with the heavy digging, wheelbarrow the manure from the allotment gate, and to repair the winter-worn fences. I can drift about waving my arms, issuing instructions and planning where to put that lovely Spring garlic, and Sandra can draw up her battle plans for total war on Mother Nature and her armies. 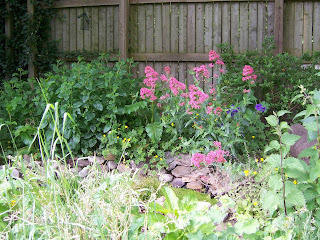 I may post pictures of the current disgraceful and neglected plot, in the hope of having Before and After pictures later in the year that actually look different from each other. "What diet was that? "and pitched in. Except Lesley the Will of Iron, who took her biscuits home to eat tomorrow after her cholesterol test. Two remaining biscuits were kept for Marjorie, who comes tomorrow to perform her weekly miracle with the vacuum cleaner and the stair carpet. 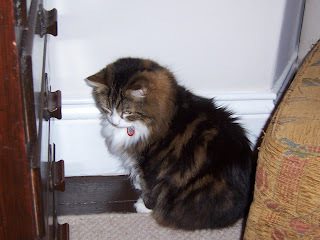 I suspect that carpet was specially woven to attract - and hold on to like grim death - every bit of fluff, grit, thread or cat hair, every dust bunny or grain of cat litter obligingly trodden through the house by Harry. Only Marjorie can do battle with it and emerge victorious; she could hoover for England and if I didn't have her to keep my house in some sort of order, I would have featured on Life of Grime by now. Problem: Visitors coming this evening, no cake in the house! 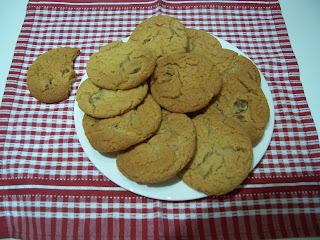 Solution: rustle up some quick crunchy biscuits, full of chunks of crystallised ginger. Visitors will all be on diets, I bet. A frosty, cold, bright day. Dog and I went to Lynn's house to oversee a television aerial being installed in her absence. I gave the aerial fitters a mug of tea, noticing too late that one of the mugs was cracked. Fitter 1: "I'm ex-Army, so don't worry." Fitter 2: "I'm from Barnsley. We 'ave jam jars there." 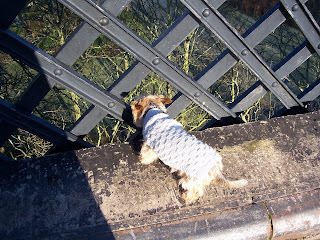 There is a huge drop from Armstrong Bridge to the park below; the dog likes to look through the railings in the hope of startling a pigeon or two, but this terrifies anyone nearby, who thinks she will fall, or worse, jump. I am used to this now, and my stomach no longer clenches when I see her do it. 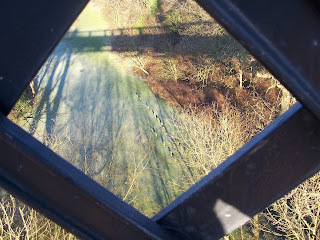 The Dene is full of birdsong and robins, very uplifting. Dog giving passers-by a heart attack. Yes, it's a long way down. Those are little pets' gravestones in the park below. 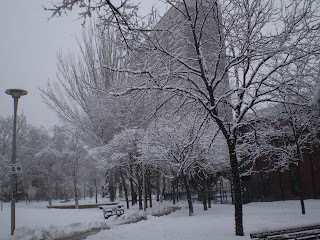 Enough whining and drivel in yesterday's post to last the rest of the week, so I'm just posting some pictures today. You know those days when nothing seems to go right? Well, today has been one of those days. Despite glorious weather, that I should just have decided to stay out to enjoy regardless of all the chores to do indoors, I didn't, and my day seems to have been frittered away rather disappointingly. The dog and I had a shortish walk and came home so that I could fill in that incomprehensible form the Tax Office has sent me so that they can tax my pension. (So-o-o-o unfair!) This entailed finding all sorts of information about savings and a great deal more. Heaven knows where my ancient Post Office account book is, and I don't recall ever reaching the £60 mark in it, but the powers-that-be want to know all about it. Dispirited, I postponed the tax form for another day and did some baking instead: a large chocolate tray-bake for someone other than me, and a very small, hopefully cute, chocolate cake for Suzy, who is 59 today. Both were to be topped with a dark chocolate icing, the tray-bake decorated with small piped white chocolate hearts, and the birthday cake with something that would reflect Suzy's interests or favourite colours, or both. Excluding her particular favourites: anything black, and cigarettes. These modest ambitions have swallowed up my day and left me feeling a dismal failure (well, not really, but let's be melodramatic). The tray-bake was fine, if fairly conventional. Suzy's cake tin had been overfilled, so that it flowed out onto the Experimental Cupcakes beneath. These were supposed to be heart-shaped, as I read recently how if you indent the paper case with a ball of foil, and pinch in the opposite side of the case, the heart shape miraculously results. Ooh, let's try that, I thought, in time for Valentine's Day. Shapeless blobs miraculously resulted for me. They are now in the freezer to press onto visiting children, who don't care so much about the cupcake aesthetic. Digression: I have a small and delightful team of official Tasters who live in my street, all aged 12 or under, and who sample new things that I've baked. They call regularly and ask if I have anything that needs to be Tasted. Their standards of criticism, constructive or otherwise, are sadly lacking. They just stuff the samples into their little beaks, say "Delicious! ", look for second helpings, and that's that. They eat anything. In a former life, they were probably little dogs. I do love them for it though. Anyway, I cooled and trimmed Suzy's cake, and it looked better, and smelled and felt fine. Catastrophe averted. The dog thought the trimmings were very nice, thank you. The dark chocolate frosting was going well until I ambitiously added some Bailey's (of which I seem to have 2 bottles, for no good reason that I can think of), whereupon it began to split. This is a disaster, and most sensible people throw it away and start again. Unsensible and undaunted, I ploughed on, knowing that a generous dusting of cocoa powder added later hides a multitude of sins. The piped hearts also looked fine at the time, but stubbornly refused to set on their baking paper - why didn't I pipe them directly onto the cake, you ask? 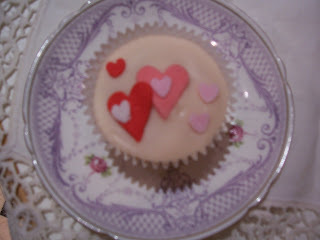 Because piping isn't a skill I possess, really, and indeed there were several decidedly wobbly hearts to be rejected. Decorating Suzy's cake proved a nightmare. 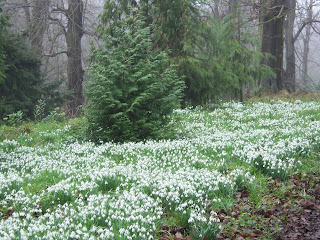 The vision: tiny white tulips in a pale green wrapper, all made of delicately coloured icing sugar. The reality: tulip failure, to be turned into white rosebuds. I can make rosebuds. Then the wrapper proved too delicate and fell apart, and the smidgin of pink blush to liven up the roses looked more like some tiny person had spilled tomato sauce on them. So in the end, in desperation and with time running out, I cut out little letters in vivid acid green - one of her favourite colours: there is a theme of sorts here, you know - spelling out SUZY OAP-1, (minus 1 - geddit?) wrapped a lime-yellow spotted ribbon round it all, hoping it would look like a granny headscarf, stuck a little striped yellow candle into the whole sorry mess, and took it down to her before her birthday actually ended. I don't think she was impressed, but without knowing the amount of discarded work that came before it, why should she be? Also, she had that wired-into-the-mains look of someone who wasn't quite ready for her own birthday party and was running out of time. I had already given my apologies to Suzy, not being party-minded and tending towards doom and despair tonight anyway. Lynn popped in, listened patiently to me moaning, and tidied my table while I made cups of tea. While I haven't yet found all the other papers I need in order to fill in the form from the Tax Office, at least the form now sits amongst a tidy heap of things labelled To Do, without a trace of white chocolate, cocoa powder or tears to be seen. My friend Tricia and I have had a long Skype talk this morning, the first 15 minutes of which were about how we can only get one webcam at once to transmit our blurry and rather unflattering images. Today she couldn't see me, though I could see us both, each in our nightclothes, at opposite ends of the day and the world. After exhausting this topic, during which I was entertained by her peering in puzzlement at the blank screen, mouth open, we moved on to my forthcoming trip, and tried to finesse the plan. But we ended up feeling that, apart from the trip to Melbourne and the Great Ocean Road (doesn't that sound exciting? and like we should be doing it on motorbikes? ), nothing needed to be planned too tightly, and that we could just do as we pleased as and when we chose. Phew, that's a relief. I know when Tricia comes over here, she fills her itinerary so full of visits to friends up and down England that she ends up worn out and has to spend Ovaltine evenings in my house in her dressing gown and slippers, trying not to doze off before 8 pm. Aw, bless. She tells me that the new Government will issue its first formal apology to its 450,000 indigenous people on February 13th, in relation to the removal of aboriginal children from their families, a policy that ran from 1915 and was only abandoned in the late 1960s. This is undoubtedly a healthy step forward, but there is no mention of compensation, so it's predictable that this tragic story will run and run. Meantime, Tricia and her work colleagues in local authority employment/benefits offices have been warned to expect thousands of additional claimants following the Government's action. As she is working flat out on overtime as it is, I expect Ovaltine evenings in Oz too, and not just for jet lag. I shall take my slippers. eBay has just emailed me to wish me a Happy Valentine's Day. How weird is that? Exquisitely sensitive or just a fusspot? This afternoon, Lynn and I have been to no less than 3 places out of town that stock fabric. Such places represent her spiritual home, so I have to try to stay focused and look interested, reminding myself that she is doing this for me, and is genuinely excited by my order of new armchairs, fabric to have the sofa re-upholstered, and a vague wish to have new cushions for my team to ruin in many different ways. Lynn sews to a very high standard, and can't understand my stupidity in such matters, my inability to 'pin wrong sides together' and still have even a dim notion of what it was I was making, and my ability to go glassy-eyed at talk of facings and piping. We have an agreement: she sews for me and I put things together for her, as she turns into a helpless girlie at the prospect of assembling a lamp or an Ikea chair. This arrangement has worked well for years, and balances out our skills and deficits. But our mission was not a success. I wanted a deep, rich burnt orange for some of the cushions, preferably in a deliciously-textured fabric. Not an easily-available colour; after turning down many shades of lurid Jaffa/terracotta/cheap brick, and finding one gorgeous velvet in nearly the right shade, I was told that it would have to be ordered, and only as a full roll, not 3 measly metres. At this point, even Lynn conceded defeat - for now. So off we went to Jesmond Dene House Hotel for a cup of coffee. This is a truly wonderful Victorian + Arts & Crafts building, now a luxurious hotel with delightful staff - and, I should add, with fabulous soft furnishings. Some of us remember when it was a grimly hideous residential school for kids with educational and behavioural difficulties, and every time we pass it, we rejoice that it was rescued from council ownership and nasty blue paintwork. This afternoon, Lynn and I are going to some fabric place to look for something glorious so that she can make new cushions for when my smart armchairs arrive (more of the chairs, Lynn's sewing skills and the hideousness of existing cushions later). I want expensive-looking, deeply luxurious, richly textured; the dog wants something she can make a nest of and spoil with sleep drool. See above. It's about 3 years' worth of our English snow, and if it had fallen round here, there would be a million little over-excited kids with wet mittens hurtling down the hill on red plastic sledges to the river at the end of the street. And a load of long-suffering parents dragging them up the hill again, muttering under their breath. Problem-solver Roger asked me if I had a heavy metal strap hanging from my camera which would probably account for the blurred photographs which are my speciality. Sadly, no. It just comes natural, like. Though I impressed myself with the spider pictures - yes, I know they too were quite indistinct, but that was because of the tumbler between me and certain death; given how much unwelcome adrenalin was coursing through my terrified veins at the time, I am proud that I even managed to locate the camera On button, let alone use it. I have just spent a considerable amount of time in the hairdresser's, having my grey roots re-done. IMO, grey hair has to be resisted - to the grave. The lovely Jane does her best to make this a positive and uplifting experience, with cheerful conversation, coffee and magazines, but it is in fact a tedious business, and a dispiriting one. There is something about all salon lighting which, when paired with a voluminous black gown hideously gathered round one's neck, accentuates and magnifies every physical flaw - and there is no escape from the mirror. This means the joy of having one's hair colour of choice restored is always spoiled by a cruel, cutting yet unspoken message about the ravages of time, and the futility of fighting a battle thirty years too late. Normally, I don't really care all that much about eyebags, wrinkles or crow's feet, the bodily effects of gravity, or even the obvious consequences of a misspent youth, but I suspect that the same number of hours spent with the Dementors would be a happier experience than my 6-weekly stint under the black gown. The dog was pleased to see me return, however. She doesn't care if I have grey, green or ginger hair, or if my laughter lines look more like furrows of despair. Come to think of it, she doesn't worry much about her own hair, her dog-breath, or her mostly missing teeth. She just does Unconditional Lurve, and does it no matter what I look like. 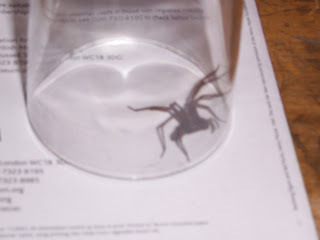 This very scary spider, with its huge sturdy legs, has obviously been living in my sitting room. 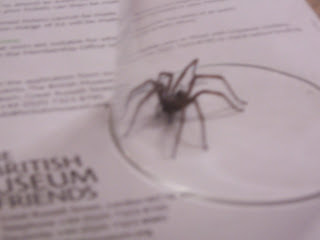 I'm not usually frightened of spiders, but this one really raised my blood pressure. What on earth has it been feeding on to grow so big? Whiskas? Pedigree Chum? 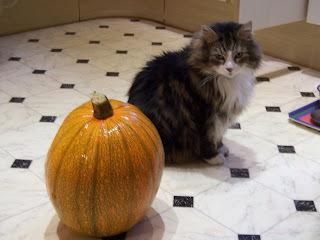 I have had to put it outside in order to protect the dog , who isn't much bigger. Harry, naturally, is still looking for it under the furniture. Today's walk was left a bit too late, and by the time Suzy and I got out, the light was fading and the wind had got up and seemed to be coming at us straight from Siberia. So, employing more of a scuttle than a stride, we hurried round the block complaining all the while, and into Suzy's house for a cup of tea. There we had a depressing conversation about Body-Mass Index scores. Suzy is taking part in the BioBank research, so now she knows what her BMI is. Mine doesn't bear thinking about, but it won't be ready for exposure to Australia's beaches, that's for sure. It is Suzy's birthday soon, and in the light of our talk, I think I shall make her a flourless chocolate cake and we can pretend that it is therefore low-calorie. The dog polished the cat's dishes, drank some of the cat's water, then made it plain that she needed to go home for tea now, thank you. The cat, who despises my dog, didn't bother to show up at all. 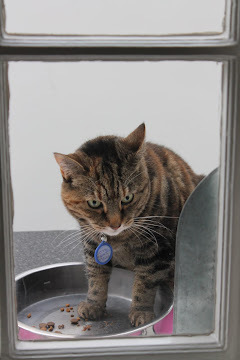 The dog is used to the contempt of cats, and does what she knows works: cleans their dishes for them. My friends and family are being stretched a bit now. They seem to have mastered getting into this blog, and some do, quite regularly (thank you, peeps!) but they report that they couldn't leave a comment, because some sort of Google ID thingy is required. Oh no, they quaver, a Google ID thingy! Now let's be clear here. These are not folk who are scared of shopping over the internet, sometimes in reckless fashion (e.g. Karen-why-buy-one-sofa-online-when-you-can-have-two) , but this comment business has fazed and discouraged them. Odd, really. Not that I'm touting for comments, of course, but they notice that I have only one so far, and it seems to matter to them. So, dear readers, be brave, get Googlified, and get those opinions out! 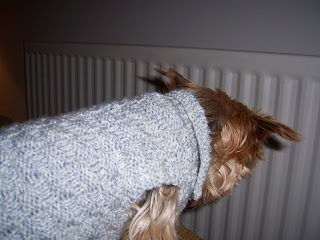 The dog trying not to model the top that Sandra knitted for her. It's known as the Uncle Walter top, after Annie's old uncle, who was fond of a woolly tank top. It would be improved by a little red scarf, I think, but hey, this is a dog, not a dolly. And this one. Dignity? Wossat? It's too cold to go out today!